Administrators have very little regard for academics. I’d say that 90 per cent of them can’t stand academics. They think we have it easy, going off to conferences and the like. They think that all we do is teach. They don’t understand the rest of the things we do like research and writing. “Peter” in Richard Hil’s Wackademia: An Insider’s Account of The Troubled University (Sydney: NewSouth Publishing, 2012), pp. 190-191. Australia’s universities are in a financial crisis. Federal and State government funding has been cut. International student numbers have fallen. Staff surveys are in flux. The University of Sydney, Australian National University, University of Tasmania, and La Trobe University have all announced cuts to academic staff and the closure of academic programs. Other higher education institutions are considering similar options. Into this fray comes Whackademia a polemical “insider expose” written by Richard Hil, a senior lecturer at Southern Cross University and a visiting scholar in peace studies at University of Sydney. 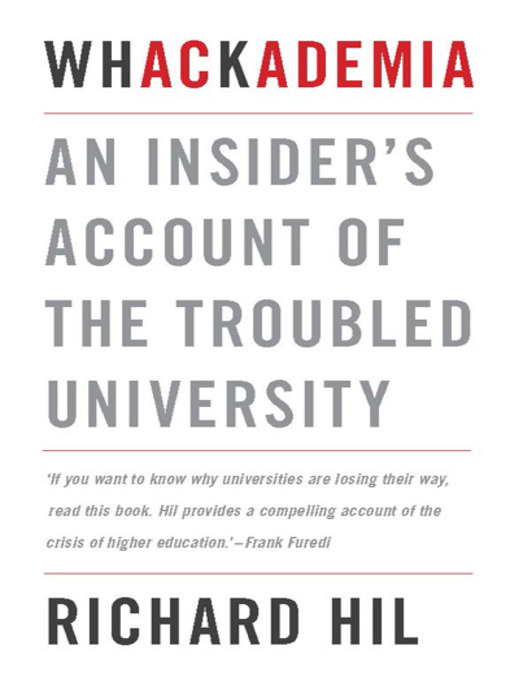 Hil’s target is Whackademia: “the repressive and constricting work culture currently operating in our universities” (p. 22) which Hil believes has corrupted academic scholarship and led to the rise of manager-administrator control. Academics must now contend with “‘massification'” and “student-shoppers” which includes “full-fee-paying overseas students” (p. 18). Hil traces Whackademia’s birth and growth to the decision of Australian Federal Education Minister John Dawkins in the 1980s to change Australia’s higher education landscape and to charge student fees (p. 73). This “imposition of free-market ideology” (p. 55) has transformed education into a highly marketed commodity in which institutions rely on an army of casual academics who teach courses (p. 39). In particular, Hil criticises “a new generation of demand-led courses” that offer pseudo-knowledge to fee-paying students (p. 188). Hil shares his student experiences in the 1970s at the University of Essex and Bristol University. He then taught at the University of the Sunshine Coast, Queensland University of Technology, and Southern Cross University. I had very different experiences and I wonder if there are some memory recall factors that may have influenced his self-narrative. I was an undergraduate student in cinema studies and politics at La Trobe University in the early-mid 1990s including a 1994 stint as a student journalist on the now-notorious Rabelais newspaper. I left my degree to pursue a freelance career in publishing before completing my degree in 2001. I pursued a Masters at Swinburne (in strategic foresight); interned in a research institute and saw it axed; worked for a Cooperative Research Centre and on a successful rebid; and did a second Masters (in counterterrorism). I have higher education student debt (and got my latest tax notice today). I worked on Swinburne’s 2008 audit by the former Australian Universities Quality Agency, and for the past three years as a research facilitator in Victoria University’s Faculty of Business and Law. I currently work on research programs, competitive grants, and commercial research contracts (pp. 145, 180), and worked previously for 18 months in quality assurance (p. 96). I am also a PhD candidate in Monash University’s School of Political and Social Inquiry. My career path has been like Billy Beane in the book and film Moneyball, or like the ‘fixer’ in Michael Clayton. This background and experiences informed how I interpreted Whackademia. For Whackademia, Hil interviewed 60 academics from Australian universities (p. 24). In contrast to investigative journalists like Lawrence Wright, Steve Coll and William D. Cohan, none of Hil’s interviewees are named ‘on the record’, because Hil believes the outspoken academics would be targeted by managers if they did so (p. 69). Hil wrote a column for several media publications also under the pseudonym ‘Joseph Gora’ (p. 23). (In contrast, I have an on-going public blog thread on academia.) Hil is thus not as thorough in his interviewees and research as Cohan and Wright are, nor as fair-minded as Coll can be. Instead, Hil believes that “the importance of their observations cannot be overstated” (p. 21) and that “complaint is rife throughout Wackademia” (p. 194). For instance, Hil notes the existence of “ghost work” (p. 167) that university workload models do not cover. Whackademia raises important issues that academics, managers, and administrators have discussed, and which the public should know about. Yet it does so primarily at the superficial level of complaints rather than in a sophisticated, multi-stakeholder approach to why these problems exist, and how they might be solved. Having managed a university complaints process I know that complaints can be significant or they can be noise due to personal factors. For every genuine complaint Hil raises I can provide either a similar and supportive anecdote or a counter-complaint about how administrators have to put up with academics. This is why Whackademia is best read as polemic or a collection of ‘water cooler’ anecdotes rather than as rigorous research: an observation that Hil’s school head pointed out to him during Whackademia‘s drafting process (p. 175). Perhaps the problem is that I am part of the group that Hil criticises: ‘para-academic’ administrators (p. 73) who are “obsequious devotees of micro-management” (p. 88) and who “do little or no research, and devote themselves with feverish intensity to form-filling, co-ordination duties and committee attendance” (p. 183). “Para-academics love this sense of impending doom”, Hil explains about the discussion of university budget processes, “it’s why they get up in the morning” (p. 184). This is pure mind-reading: Hil didn’t ask his ‘para-academics’ what they really felt or do an ethnographic study. Are there ‘para-researchers’ as well? 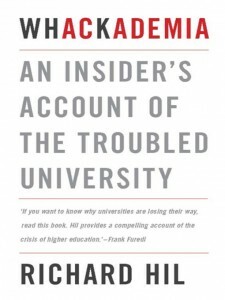 Administrators are described in negative stereotypes including being “performance-obsessed” (p. 132), as “university mandarins” (p. 16), as a “new organisational supremo” (pp. 171-172) and as an “administrative supremo” (pp. 181, 189). This is scapegoating and demonising a social group on the basis of their university HR contract status. Another problem is the proliferation of forms and “deadlines that suit administrators rather than academics” (pp. 93, 172). The worst administrators are those who calculate the workload model (p. 169). As a peace studies scholar Hil understands the power of language, framing, and ‘othering’. Why then does he ‘other’ administrators and ‘para-academics’, none of whom are interviewed or who have an opportunity to respond to the many academic complaints? In fact, university enterprise bargaining agreements (EBA) differentiate between management and academics on the one hand, and administrators on the other. The EBA defines different incentive structures that also shape cultural perceptions between each group. Management and academics are paid by an academic salary scale. They receive performance-based incentives such as conference travel and institutional research funding. Administrators do not receive these privileges — even if they produce research or advise on the relevant policies — and their HEW salary scale is lower. They are often employed on short-term rather than continuing contracts. Hil omits several important things about administrators and ‘para-academics’. They may also be degree-qualified. They may see hundreds of academic CVs and competitive grants, so they can see patterns of success and failure. They can counsel academics not to make career-limiting decisions — which they may in fact have done. Hil raises a number of issues that are important to administrators: perceptions of academic flexible time (p. 14); full-time staff benefits compared with casuals (p. 20); and the potential misuse of leave applications (p. 187). But he then immediately dismisses these concerns as irrelevant rather than signals of status envy. The psychological gambit Hil uses throughout Whackademia is called ‘shifting the blame’ and it weakens the book’s critique. At the root of administrator and ‘para-academic’ concerns is a sense that academics get a preferential set of career, financial and research opportunities that administrators (and casuals) do not. Academics can then have entitlement about these opportunities: they are superior or more gifted than the people around them. Compounding this, some academics do not live up to their role expectations and scholarship, and may attempt to ‘game’ the system. Administrators can tell this from institutional research data. Why should this behaviour be accepted and tolerated amongst scholars and professionals? Ted Gurr’s relative deprivation thesis; Leon Festinger’s cognitive dissonance; Barry Oshry’s organisational analysis; Daniel Kahneman and Amos Tversky’s biases and framing; and many others have explained why these dynamics exist, and why institutions and managers are very unlikely to change them anytime soon. The deeper dynamic that remains unexplored is the circulation of elites and meritocratic access to it in universities. Hil’s attack on administrators and ‘para-academics’ totally misses this debate and instead potentially contributes to the marginalisation of these valuable university staff. Many administrators don’t produce research because their universities don’t value and incentivise them as researchers in the same way as academics. Senior managers and the professoriate rarely act when this status difference is raised: status protection. I understand how to write and research: I have had many dialogues with university managers and academics on this, including how to interpret and use ERA journal rankings to develop a research program. They are a start to a much deeper conversation that is closer to what Hil wants to occur (p. 215). The other administrators I know often have deep institutional capital. Some academics ignore this and mistreat administrators and ignore this expertise. Where Hil ‘essentialises’ identity I see a distinction that can be traced to the EBA, to HR contracts, and ultimately to past decisions by university management when they scope and create the administrator roles. It’s a (university HR contract) decision that administrators have to live with but it doesn’t define them as people. The problems that Hil and his interviewees highlight exist for important reasons – not explained in Whackademia. Universities are what Canadian management scholar Henry Mintzberg describes as machine bureaucracies (and sometimes professional bureaucracies) that rely on workload models, and policies and procedures to manage staff. This form leads inevitably to elites, power struggles, patronage networks, information asymmetries, and career ambition. Hil presents a romanticised image of overworked academics, and their Golden Age past, but I have seen and been caught in Machiavellian power struggles that felt like a Game of Thrones episode. I find lessons (not necessarily endorsed) in Henry Kissinger’s Harvard International Seminar and also in the troubled track record of defence intellectual who sought to speak truth to power. Administrators do not blindly collaborate with managers and school heads as Hil suggests, or acquiesce to their whims. Instead, administrators are often negotiators in a multi-stakeholder network of different and competing interests. They can see the unintended consequences of change initiatives and often make process redesign requests that many academics are unaware of. They also often take the academic’s side on research issues. Hil’s advice on career and research management is also problematic. Research administrators give “minimal attention” to “the intellectual content or social purpose of the research” (p. 133) but this is false: competitive grants do not succeed without a compelling, well-formed research program or project proposal. How can Hil know this unless he has attended the grant and project development meetings of many research teams? (I have.) The Australian Research Council (ARC) team that designed the Excellence for Research in Australia exercise had a bibliometrics background and benchmarked similar exercises in the United States, the United Kingdom, and New Zealand. The team were shocked at how managers used the ERA journal rankings – but this happens with any ranking system. The promotions criteria that Hil ascribes to ERA in fact existed prior to it: Associate Professor and Professor level academics are often promoted on the basis of their competitive grant and publications track record (p. 156). ARC grants are not a lottery: Hil might have talked with the ARC, ARC assessors or successful teams, or looked at the ARC’s funding guidance to applicants. Academics who follow Hil’s advice will damage the probability of ARC grant success and possibly their research careers. A quality assurance team would log Hil’s process for “on-line marking” and forms as candidates for a Lean Kaizen exercise of process redesign and improvement to remove ‘muda’ or waste (pp. 178-179). I am on two academic research committees and we do not run our meetings like Hil describes (pp. 184-187) and nor would a commercial environment. I do not respect academics who attend meetings and who don’t contribute on discussion items where they have expertise or roles, or who just attend to get workload points. These academics waste mine and others’ attention and time. I find that in contrast to Hil many academics lack basic time and project management skills, and would benefit from a methodology like David Allen’s Getting Things Done, the Pomodoro Technique, Personal Kanban, Lean Startup or Scrum (p. 141). These techniques resolve the ‘busyness’ dilemma that Hil and many of his interviewees raise, as do practices in agile project management and software development. In some cases these problems exist because of failures in strategic investment and infrastructure, and the continued existence of manual work processes when more humane alternatives are available. School heads make private judgments about resource allocation not on the basis of a “differential exercise of power”, “favor” or “today’s regulatory rationalities” (p. 91) but rather a sense of how the academic has performed against the Minimum Standards for Academic Levels (MSALs) that the EBA defines for each academic level. My experience in talking with school heads is that the “more seasoned academics who are perhaps most resistant to the new order” (p. 91) get the most attention rather than the academics who actually perform well at their MSALs. In such cases, the problem isn’t school heads or administrators: it’s potentially the academic’s failure to uphold the professional standards of their discipline or the long-term effects of institutionalisation. There may also be personal mitigative factors that have to be handled fairly and sensitively. But I also know many hard-working and research-productive casuals who deserve full-time status. Consequently, Hil’s tactics (pp. 203-205) of “resistance . . . dissidence and subversion” (p. 202) will mostly fail, backfire, and continue to ‘other’ the administrators and ‘para-academics’ who must deal with the consequences. Hil mistakenly assumes that administrators do not support socially progressive projects and research proposals. He does not articulate a theoretical framework that is aware of how organisations respond to, choreograph and build in the scope for such activities as part of their ideological landscapes. Academics who want to adopt Hil’s progressive ideals (pp. 217-220) might gain further insights through direct engagement with the peace studies and nonviolence work of Johan Galtung (Searching For Peace: The Road To Transcend), Mark Juergensmeyer’s interpretation of Satyagrahan ethics in conflict resolution (Gandhi’s Way), Jonathan Schell (The Unconquerable World), Peter Ackerman and Jack Duvall (A Force More Powerful), Riane Eisler (The Chalice and the Blade), Sohail Inayatullah (Understanding Sarkar), and the arch-strategist Gene Sharp. Throw in Barry Buzan and Lene Hansen’s study The Evolution of International Security Studies for their discussion of the inter-paradigmatic debates between international security and peace studies scholars that echoes the academic-‘para-academic’ distinction that Hil makes. Alternatively, academics might work for a “paradigm-buster” (pp 208-215) like the Oases Graduate School in Hawthorn, Victoria; Newcastle’s annual This Is Not Art festival; the think tank Centre for Policy Development; or the media outlet New Matilda. Several of these were founded by Generation X university graduates. How does Hil know that today’s graduates do not have the civic awareness he values? Who did he interview? What student experience surveys did he look at? We don’t know how Hil arrived at his opinion and what evidence he considered. “There remains a widespread belief that academics have it good when compared to workers elsewhere,” Hil notes (p. 13). “In some cases this is probably true.” It’s an initial observation that could have been explored further or that could be the basis for a very interesting comparative research project. Hil doesn’t explore it further nor does he examine the varied causes of the problems and complaints that he documents. He appears to take many of his interviewees at face value: we don’t know if there was selection bias in his interview sample, what the inclusion criteria were, who was intervieweed and not included, and who was nominated but not interviewed. There could be confirmation bias and possible sampling effects from specific academic disciplines, sub-disciplines (Hil interviews several peace studies colleagues), NTEU union members, and universities. The media outlets that Hil samples have each crafted their own crisis narratives about universities, and so their reportage can have subtle information biases. This is why I find Cohan, Coll and Wright’s investigative journalism as a more viable model: they interview many people and show several sides to a situation and organisation. Regrettably, Whackademia contributes to the very “negative public mythology” (p. 13) about universities and academics that Hil diagnoses and seeks to counter. In part the problem is when a term like ‘audit culture’ or ‘free-market ideology’ becomes the accepted frame and can thus be a barrier to further differential diagnosis and emergent, reflective insights. If Hil considers writing a follow-up book then he might look to the scholar Rakesh Khurana (From Higher Aims To Hired Hands) as one possible critical model to use.